Yes I just made a reference to a meme that belongs back in 2012 but I don't care. First of all, I have a confession to make... I kinda hate the colour pink. I know I should be kicked off Planet Girly for saying that but I do make one exception and that exception is pastel pink nail polishes. There's just something in how they flatter each skin tone and how they manage to stand out yet still remain soft and feminine. 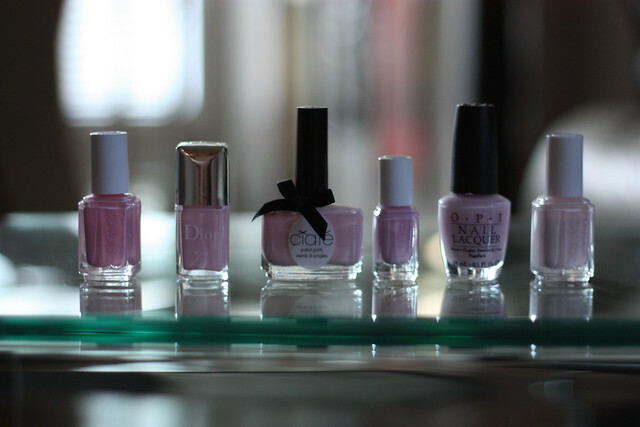 This post is an ode to the 6 pastel pinks that have remained on rotation over the last few years. - the peachiest of the bunch. Application isn't the best but if you can smooth it out in 3 even coats it has decent lasting power and looks amazing with a bit of a tan. Excellent pedicure colour. - Tutu is a hint cooler toned and it comes with that patented thick Dior brush that so many people love (and I hate). I prefer the Ciate Strawberry Milkshake because it's opaque in 2 coats and wears like a champion. - this is what started it all for me so it holds a special place in my heart. It's a chalky cool toned pale pastel pink, it dries down and wears a shade or two darker and warmer than when you first apply it. Application is better than Essie Fiji (next up) but still requires a steady hand and 2-3 coats for an even finish. I'd say in terms of overall performance, Ciate Strawberry Milkshake wins the battle. It's in the middle of the road in terms of cool/warm tone of pink, it applies evenly, it's not limited edition and the bottle is adorable. Am I alone here in my pastel pink obsession? What colours do you like to wear the most in the warmer months? Click through to see what my autumn nail wardrobe consists of... short nails, rejoice!